Welcome to Magazine Monday. 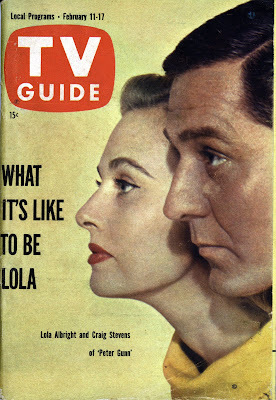 Today’s we’ve got TV Guide from February 11-17, 1961. 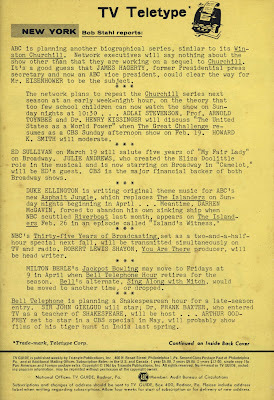 In case you missed my previous TV Guide/Disneyland posts, you can visit them here: Why Disney Changed his mind about TV – October 1954 (link) and the four issue series “Disney Album” from January 1955 (link). 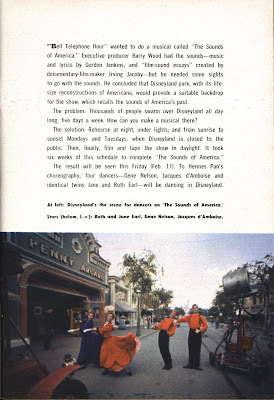 The “Bell Telephone Hour” was presenting a special show this week “The Sounds of America” filmed and videotaped entirely on location at Disneyland! 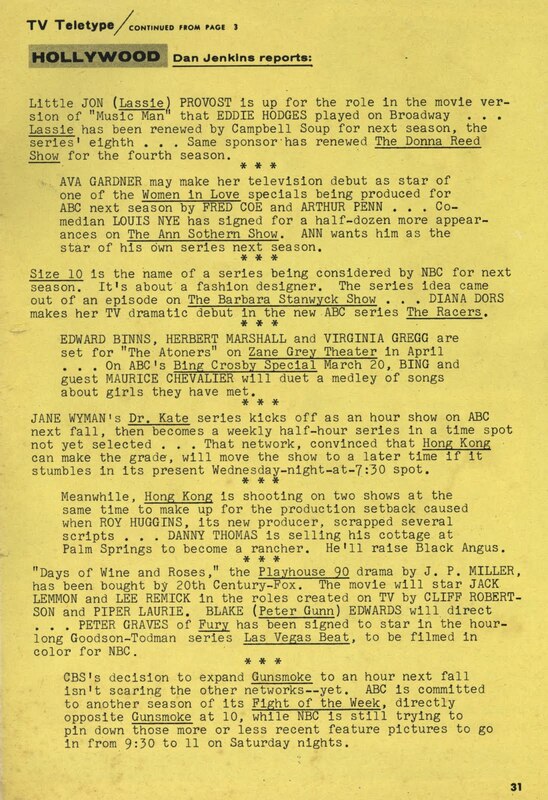 Here’s the page that shows the listing for Friday night at 9:00pm. 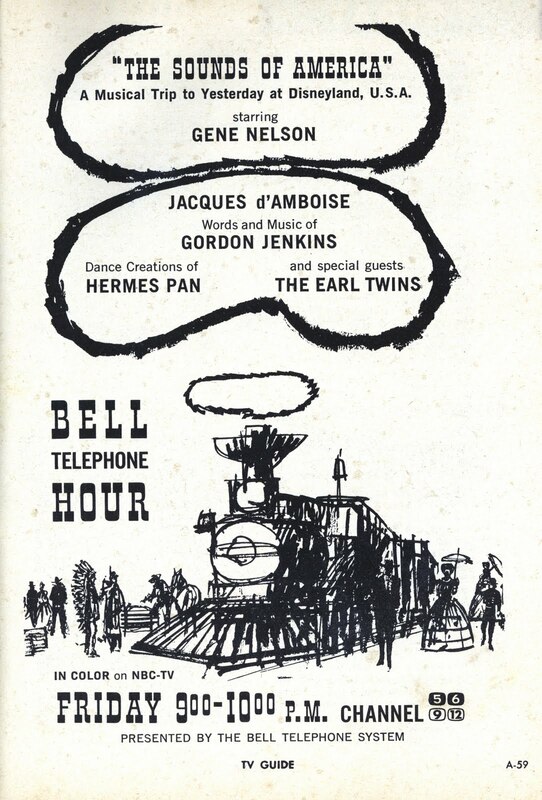 The Bell Telephone Hour was in Color since its TV debut in 1959. Good thing the Twilight Zone (late into Season one) is on at 10:00pm, there's an excellent performance by Jack Klugman that you won’t want to miss. This looks like a spectacular show. Good luck finding it. 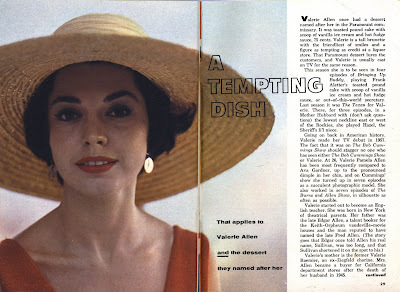 A search on the web came up pretty dry, but I’m working on a lead. If anyone has a copy or can get one, let me know. 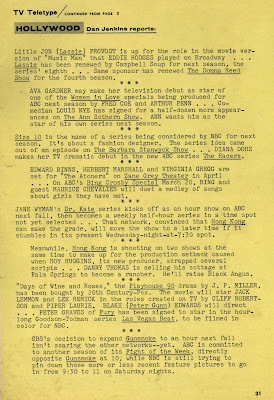 My favorite TV Teletype’s, this is the “New York” version found in the front of the guide. Hollywood is in the back. Here are a couple nice photos of what ladies looked like in 1961. 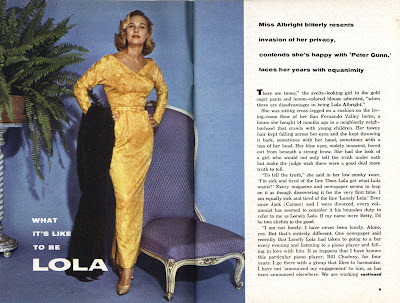 The articles are kind of dry, let me know if you have an interest in the rest of the articles and I’ll post them later. 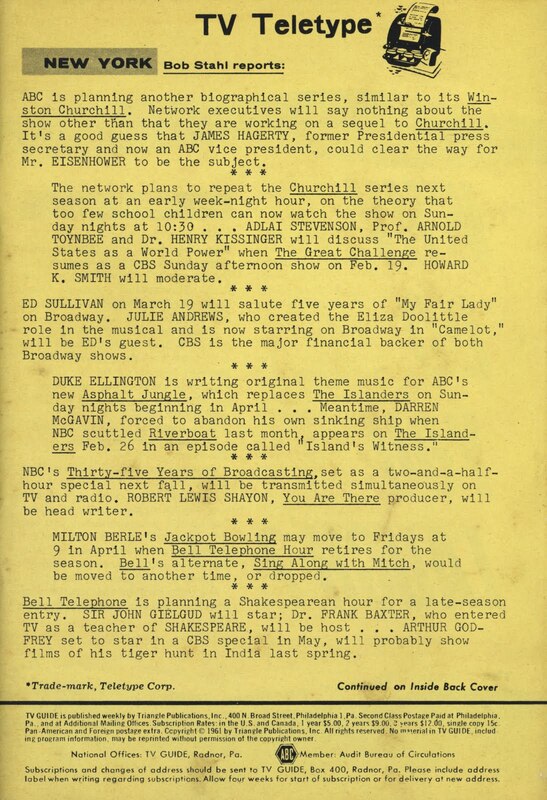 The TV Teletype “Hollywood” version has lots of fun information. Gunsmoke will expand to an hour; it was a half hour show at first? Hope you can find more info on that musical; really odd that I've never seen a thing about it. Hermes Pan was a fantastic choreographer from MGM, so it must have been a decent production. 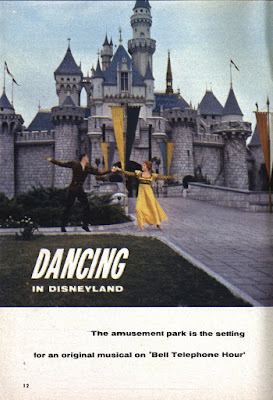 I get the feeling that there is a lot more dancing than there is Disneyland in that special... but it would be fascinating to see anyway! 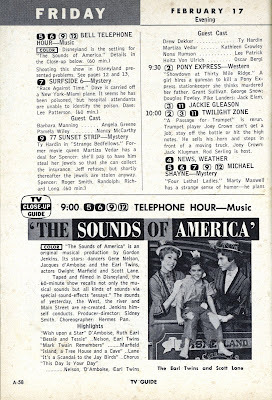 That "Twilight Zone" episode is a good one, I still remember the trumpet melody. Would love to see that show. Never heard of it before either. Good luck finding a copy! Please let me know if you find this, Jacques d'Amboise is my sister's father-in-law, and we are all trying to locate any footage of him we can. I have a copy guys! I would be happy to share with any of you. Mine is a VHS and you are right, much more dancing than Disneyland. I have to agree with "generic viagra", and appreciate his razor-sharp insight and topical humor. I hope he comments much more often. Or dies painfully.